As businesses integrate artificial intelligence offerings into their portfolios, classes of AI technologies are emerging, according to a CB Insights report. Experimental applications, still in the early stages with low adoption and market strength, include back office automation, synthetic training data and GANs, a type of neural network. "Necessary" applications have high market strength and industry adoption. In 2019, the AI applications and fields in this category include open source frameworks and edge computing (infrastructure), facial recognition and medical imaging (computer vision), predictive maintenance (natural language processing) and e-commerce searches (natural language processing). Network optimization is in the "threatening" category (high market potential, low adoption), stymied by network latency. Cyberthreat hunting sits in the "transitory" quadrant (high adoption, low market potential), working against dispersed networks, dynamic environments and false positive problems. CIOs have to understand the maturity of any technology application brought into their fold, but artificial intelligence is still a black box for many organizations. The pioneers are out ahead innovating, but the average organization is still conservative with implementation and experimentation. Failures to implement the foundational building blocks that support AI investments, such as talent and digitization, hinder many businesses trying to get projects off the ground. In the last four years, enterprise implementations of AI rose 270%, according to a Gartner CIO survey, a testament to the technology's implications across industries. But even with implementations tripling last year, talent shortages continue to pose the greatest challenges to deployment for more than half of organizations. 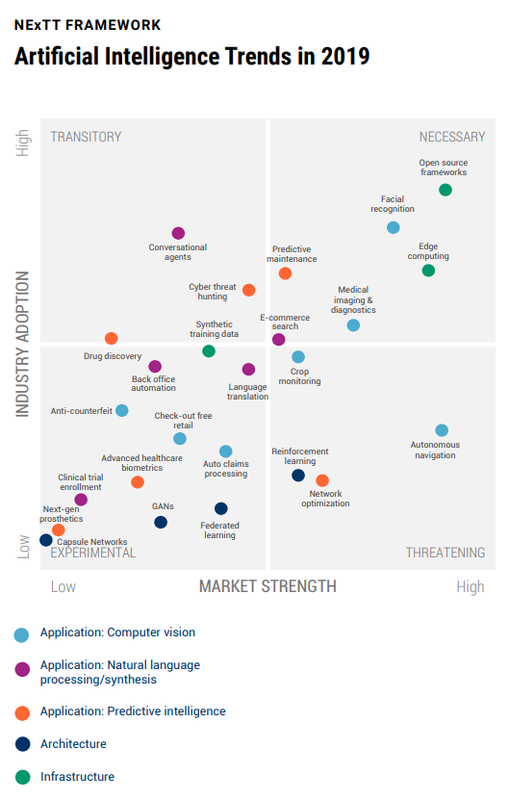 More vendors are offering low code or off-the-shelf AI offerings, easing the talent and resource burdens AI investments can demand. As more applications are added on to the company network, governance policies will undergo a transformation in the next few years to address accompanying the risks, privacy and ethics. The prominence and maturity of infrastructure AI solutions, such as open source frameworks and edge computing, underscore not only the importance of the cloud as a foundation for AI technologies, but also as a target of AI applications for optimization.